Translator Tara Chace discusses Angryman, her work as a translator, and the “Nordic” sensibility in children’s books. NSB: What languages do you translate, and how did you become a book translator? Do you work on adult as well as children’s literature? TC: I translate Norwegian, Swedish, and Danish. I suppose I took a unique route to translating books. I spent my junior year abroad in Bergen, Norway. I was studying biochemistry at the time, which evolved into a double major in biochemistry and Scandinavian, and ultimately I went full-on Scandinavian languages and literature. I continued and earned an MA and PhD in Scandinavian literature. One day when I was a starving graduate student, this was in the days before the Internet, someone offered me money to translate an article about a sailor. The translation agency was located in a crooked little building under a gritty, urban bridge, and it really was almost like someone in a trench coat said, “Psst! Wanna do some translating?” It was interesting material and fun to translate and the money helped me pay for my expensive book habit. So, I finished my dissertation on postmodern literature but also started saying yes to translations as they came along. Ultimately, I decided to become a translator instead of a professor of literature because I love contemporary literature. Scandinavian literature professors often end up teaching classes on Ibsen and Strindberg and Isak Dinesen over and over again — and those are indeed important and fascinating authors — but I wanted to take up more recent fare. And it’s all worked out like a dream. My first offer to translate a book was passed along by the late Steve Murray, who translated Stieg Larsson’s Girl with the Dragon Tattoo and so many other books. He and his wife Tina Nunnally have been wonderful mentors to me. Steve had been offered a young-adult novel, but he had no kids and no interest in translating for children, so that worked out perfectly for both of us. I think he might have sent every publisher who ever approached him with a children’s book to me. For me, it was great! I’ve always loved children’s books. I have two young kids and have spent the last decade reading books aloud to them. I test out my translations on them. My son was thrilled to be the first kid to hear Jo Nesbø’s Doctor Proctor’s Fart Powder in English. And both of my kids have always loved Sven Nordqvist’s The Adventures of Pettson and Findus series. The stories are so clever and the illustrations so imaginative and detailed. So, I’ve just never looked back. I love books. I love words. I love translation. Every day when I go to work, I feel like I’m doing my part to promote global understanding. In that vein, I do translate for adults as well. Global understanding is probably going to have to include grown-ups, right? NSB: ANGRYMAN is such a powerful book, winner of many awards in Europe and Scandinavia. What were your first thoughts when you received the manuscript? TC: Many Americans may have noticed Svein Nyhus’s illustrations in What Does the Fox Say? by Ylvis and Christian Løchstøer and might expect something goofy or lighthearted in Angryman. I’ve been a big fan of his illustrations ever since I picked up a copy of his 1999 book Verden har ingen hjørner [The World Has No Corners].That was a very sober, philosophical children’s book. And I knew that he and Gro Dahle have continued to push the boundaries of what readers commonly find in picture books with more serious topics. Even so, Angryman took my breath away. NSB: You’ve translated other Scandinavian picture books for us-but they were humorous. This is much darker and the text is quite detailed. 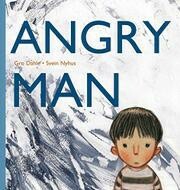 Do you see any similarities between ANGRYMAN and other picture books or novels you’ve translated? Do you think it has a “Nordic” sensibility? I do think the book has a “Nordic” sensibility, particularly in its willingness to tackle difficult topics artistically but also matter-of-factly. In that sense, it’s similar to other young-adult books I’ve translated like I Need You More Than I Love You and I Love You to Bits by Gunnar Ardelius, which is about first love — but also bipolar disorder. Or Heart’s Delight by Per Nilsson, again about first love but from the perspective of a young protagonist who feels destroyed after a break-up. In general, Scandinavian children’s books don’t shy away from topics that Americans often find difficult to acknowledge bluntly in the context of children’s literature, things like alcoholism or poverty, even though these things very much affect the lives of children. “Sleep,” Mama shouts with scissors in her voice. How direct is that translation? TC: This is really a word-for-word translation of the Norwegian. Gro Dahle is an amazing writer, isn’t she? NSB: With poetic language, do you go back to the author or is there latitude for interpretation? TC: Both. The better the author is, the less you want to tinker with things, obviously. But sometimes there has to be latitude with the details in order to convey the same overall experience to an audience. The Norwegian uses one word to say “apple-cake-happy,” because Norwegian creates compound words the way German does. I ended up using “cheerful as apple pie” in English. Apple cake is quite ordinary in Norway, whereas apple pie would be more exotic there. By contrast, apple pie is familiar in the US, but an apple cake (especially the way Norwegians picture it with attractively arranged apple slices on the top) would be more exotic to most American kids. In this case, I “localized” the apple recipe to evoke the same familiar, warm, homey feeling, but I needed different words to get to that feeling. Just before that the Norwegian also features a kransekake decorated with flags. Although Paul Hollywood made one of these festive Norwegian cakes for The Great British Bake-Off, in the translation it became a three-layer birthday cake with candles on top — relatably conveying the same festive message to young American readers. If you think about it, the baked goods in the text really are vehicles for conveying emotions. If the American reader is jarred by an inexplicable image of flags on a stacked ring cake, then the reader is also not focusing on the central messages in the text. As a translator, I want to help the English-speaking reader experience the story the way a Norwegian reader can experience the original, without anything that would be too distracting from the author’s message. NSB: When translating a picture book, do you focus purely on the words, or is there an awareness of the illustration as well? You definitely have to keep both in mind. There is this idea out there that children’s literature is somehow “easier” to translate than adult literature. I would argue it’s possibly the opposite: children’s literature combines specific poetic and diachronic cultural references and layers of social issues with visual art (and sometimes music). Illustrations convey such a large portion of the story. It’s very hard to get all those elements interacting harmoniously. In fact, with picture books and especially Scandinavian picture books — which tend to put a lot more text on a page than an American book — the grown-up and the child will often take away a very different experience from the book. Children really do study the illustrations. The grown-up spends all this time reading the text, sometimes a couple hundred words per page (as is the case in this book). Then it’s time to turn the page. There’s not much time for the adult reader to appreciate the pictures. But the child has all the time in the world. So the words and the pictures really have to work together, and the words in the translation really need to “see” the pictures, too. NSB: Is there anything I should have asked you about, that I didn’t?! TC: Children’s literature is usually meant to be read aloud. Before I submit a manuscript, I always read it aloud to my husband, who has been my long-time editor and who gives fabulous feedback on the sound of a text — nuance and meter and alliteration and more. As we did that with Angryman, it really had us both sobbing. It was hard but incredibly moving to read aloud. NSB: Thanks for sharing all of this with us, Tara! Angryman is on sale April 2019. Visit www.northsouth.com for more information about our beautiful picture books, from authors and illustrators all over the world.